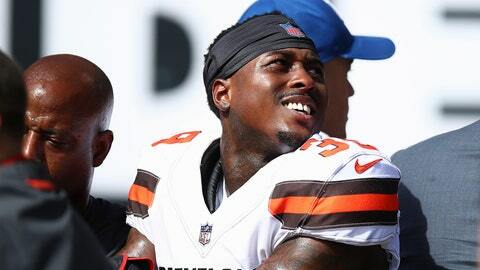 CLEVELAND (AP) — The Browns placed starting cornerback Terrance Mitchell on injured reserve with a broken right wrist. Mitchell got hurt in the second quarter of Sunday’s 45-42 loss at Oakland. He underwent surgery on Monday, when coach Hue Jackson said he didn’t think Mitchell’s injury was season-ending. The team can designate two players to return from injured reserve after six weeks. Mitchell broke his wrist while breaking up a pass intended for Jordy Nelson. Following the play, Mitchell grabbed his arm and immediately went to the sideline. To replace Mitchell, the Browns signed Jeremiah McKinnon from their practice squad. McKinnon is in his first NFL season out of Florida International. He was originally signed by Dallas in 2016. Mitchell, who signed with Cleveland as unrestricted free agent earlier this year, had 19 tackles and one interception in four starts. Jackson said either E.J. Gaines or T.J. Carrie will replace Mitchell as a starter.